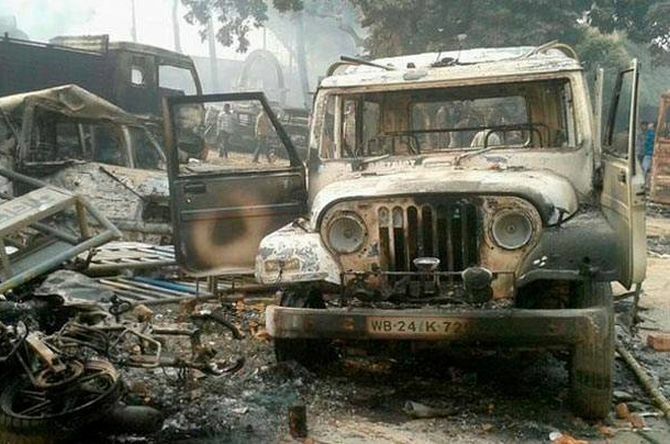 Rediff.com » News » Malda decoded: What really happened? Malda decoded: What really happened? India's Muslims need to assert their educational and economic upliftment and political empowerment rather than be provoked by communal remarks, says Mohammad Sajjad, reflecting on the Malda riot. A Muslim religious organisation, Anjuman Ahl e Sunnatul Jamaat, is said to have organised the event which resulted in violence in Kaliachak, Malda, in early January. Apparently, this group subscribes to the Barelwi ideology of Sunni Muslims, closer to Sufi traditions. Acoording to reports, the group is said to have been outraged by disgusting remarks made on December 1 against the Prophet Muhammad by somebody claiming to be a member of the Hindu Mahasabha. The Mahasabha doesn't own him up. These derogatory remarks reportedly came after provocation from Uttar Pradesh Minister Azam Khan who made disgusting and equally unsubstantiated remarks against Rashtriya Swayamsevak Sangh activists in November. Khan, by now, has earned notoriety by making such polarising remarks. Already, he owes an explanation on the evident administrative complicity in the making of the Muzaffarnagar riots of September 2013. Azam Khan is also the minister in charge of Muzaffarnagar affairs. The Uttar Pradesh government owes an explanation on neglecting the hapless, displaced, people of Muzaffarnagar and adjoining districts. Surprisingly, the Muslims forget this specific genesis of the controversy. They refuse to put Azam Khan in the dock. There is no mass mobilisation against the Uttar Pradesh administration led by Akhilesh Yadav. It is no secret that the Muzaffarnagar riots served the electoral political purpose of polarising communities, whereby the Jats supporting the Lok Dal and the Dalits supporting the Bahujan Samaj Party were to be communalised to go over to the side of the Bharatiya Janata Party, and Muslims supporting the Lok Dal, the Congress, and the BSP were to be won over to the side of the Samajwadi Party. Despite such nasty designs being exposed, there has hardly been any mass mobilisation against such a bloody political conspiracy. Self-serving moulvis and other such figures see the potential of becoming leaders only on the issue of remarks made against their Prophet by a nondescript person hardly endorsed by any significant section of Hindus. The moulvi is yet to be arrested, enough of Muslim appeasement! The response from the Madhubani audience reveals a lot, and highlights that all is not lost. A counter-mobilisation against religious frenzy is quite possible. It would have been wiser for Muslims not to react to remarks made by people just to hog the limelight. But things won't be that simple. From Muzaffarnagar to Bengaluru and Delhi, sections of Muslims came out onto the streets in December, some demanding the death penalty for the alleged offender who is already in jail. This was in utter disregard of the rule of law of the land. Even more intriguing is that after a long gap of many weeks, Muslims in Malda, Bengal, suddenly rose up to protest against the remarks, reportedly on the call of the Idara-e-Sharia, founded in 1968 at Sultanganj in Patna by Barelwi cleric Maulana Arshadul Qadri (1925 to 2002). This came out of sectarian rivalry with the Deoband-oriented Imarat-e-Shariahof Phulwari Sharif in Patna, which was founded in 1921 by Maulana Ablmohasin Mohammad Sajjad (1880 to 1940). These institutions run a chain of madrasas and also a chain of Dar-ul-Ifta and Dar-ul-Qaza across Bihar, Bengal, Orissa, and Jharkhand adjudicating on disputes related mainly to marriage, and inheritance of ancestral properties. Against this backdrop, it is necessary to examine and investigate the origin, function and worldview of the Anjuman Ahl e Sunnatul Jamaat of Kaliachak, Malda. Equally, or more important, is to introspect: Why does the clergy exercise such a profound influence on Muslim communities despite the emergence of a considerable section of middle class Muslims? Moreover, why can't the non-religious leadership of Muslims mobilise the community on meaningful issues? As I am currently based at Kishanganj, Bihar, reports are coming in that here too such frenzied mobilisation is likely to take place. I have spoken to some responsible people to pre-empt it. I hope they will succeed in persuading arguably naive people. Districts in West Bengal like Malda, Murshidabad and North Dinajpur and almost adjacent districts in Bihar like Kishanganj, Purnia, Araria and Katihar have a high concentration of Muslims, who are also lowest on human development indices, including crucial indices like education, health and the economy. There has not been such passionate mass mobilisation about issues of economic-educational uplift and political empowerment. We are already face to face with Salafi-Wahabi radicalism across the globe. Now even Sufi-inclined Barelwis are getting radicalised. Salman Taseer, the governor of Pakistan Punjab, is said to have been killed by a Barelwi radical. Some pockets of high Muslim concentration have received massive funds from the Saudi monarchy to operate huge residential madrasas and masjids. The Ibn-e-Taimiya madrasa of Chandanwara (near Dhaka in east Champaran, Motihari), and the Tauhid Trust of Kishanganj are major examples. The Saudi monarchy extends this patronage to gain legitimacy for the Salafi-Wahabi ideology. Intriguingly, these segments of Muslims don't ask for Saudi funding to run quality residential schools of modern education and to run well eqipped hospitals. The day Muslims rise to demand such favours, needless to say, the Saudi monarchy will readily oblige them. What we see today is men in Muslim dominated villages in many parts of Bihar and West Bengal -- men who who have not migrated elsewhere for livelihood and education -- indulge in politicking over the recruitment and dismissal of Pesh-Imams (prayer leaders) in their village mosques. These men often have close links with local goons as well as the local police, from which they derive their power of intimidation besides siphoning off funds for mosques and madrasas. These whimsical dismissal-recruitment games are based invariably on sectarian divides. Thus, adolescent young men get radicalised and many villages become seething cauldrons of sectarian (maslaki) scuffles and violence. In my ancestral village of Turkauliya (in Saraiya-Paroo, Muzaffarpur, Bihar, where there was communal tension in 2014 and communal violence in another village Azizpur on January 18, 2015 followed by another bout of such violence in Lalganj on November 18, 2015), I can see such menacing developments whereby influential Muslim men mobilise Muslim youth along Salafi-Wahabi lines. This creates heartburn among subscribers of the Barelwi sect who happen to be in a numerical majority, but who have traditionally been economically and otherwise weaker though they have recently gained some improvement in their economic status. Malda has 12 assembly seats, of which only one -- Habibpur -- has less than 5 per cent Muslims. Three seats have between 22 and 30 per cent Muslims. The rest have between 42 and 89 per cent Muslims. Opium cultivation, cross-border trade and the police-criminal nexus historically define the socio-economic life of Malda, inevitably having a tremendous bearing on politics. In Malda, there has been a long history of strange relationships between the police and the local population, more specifically among the Muslims. Historian Professor Suranjan Das, currently the vice-chancellor of Jadavpur University and a former vice-chancellor of Calcutta University, published a detailed research essay on this aspect in the influential journal, Economic and Political Weekly (volume 26, no 3, 1991), Some other scholars have also explored the phenomenon. However, all these academic explorations are confined to the late colonial and pre-Communist era of the post Independence period. Muslims in this part of West Bengal favour the Congress and this may have worried Chief Minister Mamata Banerjee, more so when talks of an alliance between the Communist Party of India-Marxist and Congress is underway for this year's assembly election. There are also reports from voluntary organisations like the Jan Jagran Shakti Sangathan whose team visited Kaliachak on January 16-17. These reports from the ground suggest that the Kaliachak violence did not have a communal orientation. Rather, it was a conflict between criminals and the police. The criminals exploited the religious procession, and under its shadow, burnt police records, noting their history of crime, smuggling, etc. Be that as it may, a serious question stares India's Muslims. When will they wake up to assert for their educational-economic uplift and political empowerment rather than be provoked by remarks, which can never sully the indelibly finest image of the Prophet? Mohammad Sajjad teaches history at Aligarh Muslim University. Currently Director, AMU Kishanganj Centre, Bihar, he has published several books including Muslim Politics in Bihar: Changing Contours. Is India in for hard times this year?